Globalisation has led to monumental changes in the world’s economy. A key facet of this era of interconnectedness has been the increasing integration of the world’s economies, with resources, money and jobs crossing international borders more than ever before. The rapid expansion and liberalisation of the international trade network has been spurred along by the creation of preferential treaties to lower barriers to trade and encourage foreign investment between signatory countries. These agreements go beyond the reduction of tariffs on goods, also covering issues such as ‘services, investment, competition policy, government procurement, e-commerce and intellectual property’, as well as labour and environment provisions. After the rapid rise of Bilateral Investment Treaties in the 1990s, in which over 1600 came into force (Australia signed 17 between 1990-1999), the latest global trend has been towards mega regional trade agreements, often referred to as ‘new generation’ free trade agreements. Examples of these agreements include the EU-Canada Comprehensive Economic and Trade Agreement (CETA), the Comprehensive and Progressive Trans Pacific Partnership (CPTPP) between 11 countries in the Pacific and the Transatlantic Trade and Investment Partnership (TTIP) between the US and the EU. and the environment. Any reasonable political measure that impacts a company’s projected profits can be equated to expropriation, with cases already launched against the banning of toxic chemicals, restrictions on tobacco advertising, requirements to stem pollution from coal plants and even for the introduction of a minimum wage. The ISDS system impedes on national sovereignty to the benefit of corporations, yet places no obligations on investors to behave responsibly, creating an asymmetric system that gives multinationals the same rights as sovereign states. The significant increase in ISDS cases worldwide has resulted in more public attention on the once obscure element of international trade agreements, particularly as more cases are brought around issues of land, water security and pollution . Public backlash around the inclusion of ISDS has accompanied the negotiation of any new trade deals; an EU call for submissions on the TTIP received a record number of responses, the vast majority of which were concerned about the inclusion of ISDS. Many countries have begun to reconsider their current trade agreement regime, and reassess the usefulness of ISDS provisions. Indonesia, South Africa, India, the EU and Poland are among those taking steps to reform their current trade regime. ISDS has been a component of Australian FTA’s and treaties for some time, with 27 currently in force that contain varying degrees of investor protections. 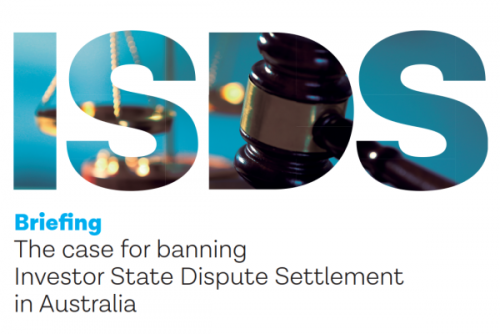 Proponents of ISDS often tout this as proof that the ISDS system is harmless, however, the unpredictable nature of ISDS has seen influxes of cases launched against states after having no cases filed previously,8 chewing up millions of taxpayer dollars to defend and putting the regulatory capacity of the government at risk. As Australia strives to lock in more and more regional trade agreements, such as RCEP and the reemerging TPP, it is vital to reassess the inclusion of ISDS in future agreements, and push for a fairer trade and investment system.